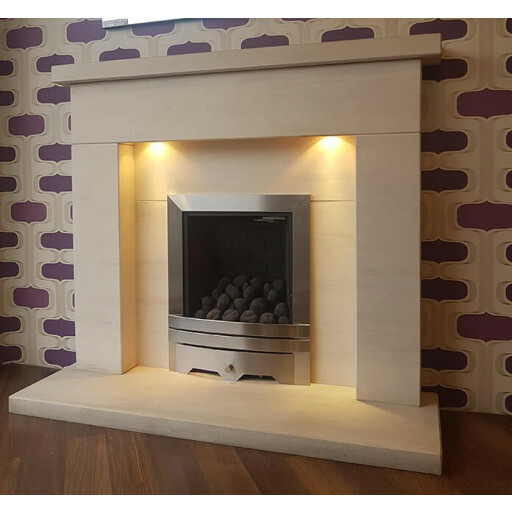 Elegant residential and business interior design schemes today often include a lovely stone fireplace as a way to showcase an attractive gas or electric fire display. Consider adding the beautiful Vaska limestone fireplace and fire package to enhance the appearance of an office, a lobby, a reception area, or a private dwelling. Designed for use with either the Eko3010 gas fire (available in standard Brass or, for an additional charge, in Brushed Steel) or the Eko1060 Brushed Steel electric fireplace display, this item supplies a charming addition to augment the decor of virtually any room. The Vaska limestone fireplace and fire package features exclusively high grade materials. The manufacturer relies upon hewn and polished Portuguese limestone to create a stunning fireplace and mantle. For hundreds of years, property owners have prized the creamy appearance, the smooth texture, and the exceptional light reflective qualities of fine limestone! This model includes embedded LED down lights, concealed on the underside of the mantle. They furnish a convenient way to direct additional illumination for your room. This fireplace includes both a flat limestone base and a slight extension over the upper mantle. Its broad, classic lines will complement a variety of different furnishings attractively. See this outstanding product at The Fireplace Warehouse soon! Great value fireplace and fire,very good fitting service. I saw this package online for an amazing price. When it arrived it was far better quality than I was expecting for the price. Would recommend to anyone.